This platform game is centered on a central hub, in which the player character Blupi (alias Eggbert) can access all of the game's seven themed worlds. At first he can only go to the practice level, where he will learn most of the controls listed above. The rest of the controls are not shown to during the practice game; they are left for the player to discover these moves while passing through the levels. The game has over 40 levels, ranging from easy to relatively difficult. The objective of each level is to collect all the treasure chests and then move to the endpoint. 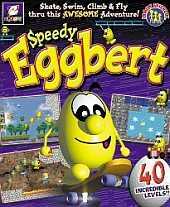 The game includes enemies which Eggbert cannot destroy normally, but can be destroyed using vehicles. The game lets Eggbert drive a Helicopter, a Glue Tank, a Jeep and a Skateboard. The Jeep and Skateboard allow Eggbert to travel past mines and detonate them without losing a life. Glue balls can be collected by Eggbert, where they can be fired as weapons from the Glue Tank or Helicopter to defeat enemies. With a level editor, on a player's account they can make up to 20 custom missions (160 custom missions for all players). They can use all the objects enemies and vehicles to make their levels, however they cannot make the large keys and doors on single player mode.